The best Indian takeaway in North London is The Tiffin Tin. NEW! The Tiffin Tin Hornsey is now open for lunch. Click to see our brand new, delicious lunchtime menu. Served from 12pm to 4pm daily, exclusive to The Tiffin Tin Hornsey. What’s the best Indian takeaway in North London? 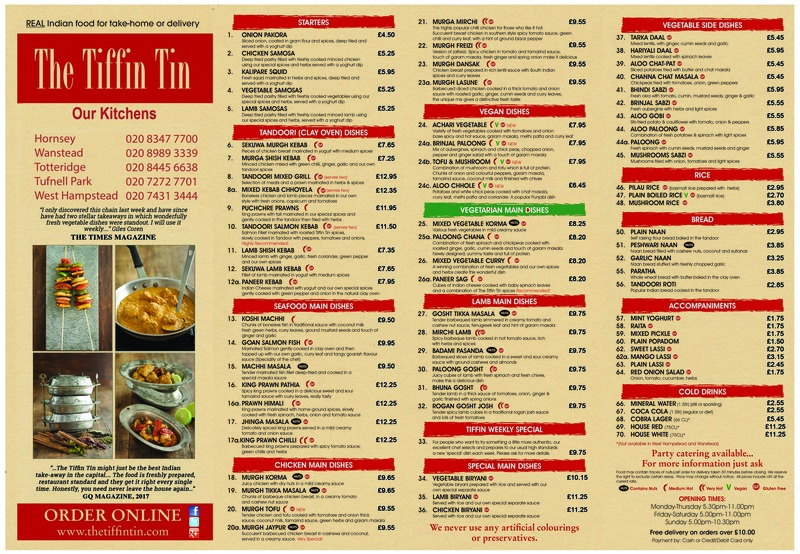 If you live in Hornsey, Totteridge Lane, Tufnell Park, Wanstead or West Hampstead the answer is The Tiffin Tin. We have five branches across North London, offering authentic Indian food for takeaway or delivery, using only quality ingredients. In 2017 GQ magazine said we might also be the best Indian takeaway in London. Order online today to find out for yourself. Thanks for signing up. Please check your inbox to confirm your subscription! By subscribing you agree to allow us to store your details so we can contact you about future promotions.